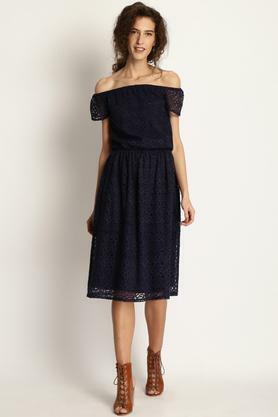 Cut to a relaxed silhouette, this knee length dress from Marie Claire is perfect for a casual day out. Made from polyester fabric, this dress will be perfect according to your convenience. Featuring a off shoulder neck, short sleeves and lace pattern, this dress possesses a stunning urbanity. Pick a relaxed style with this knee length dress. Style this dress with a pair of pumps for a sophisticated allure.